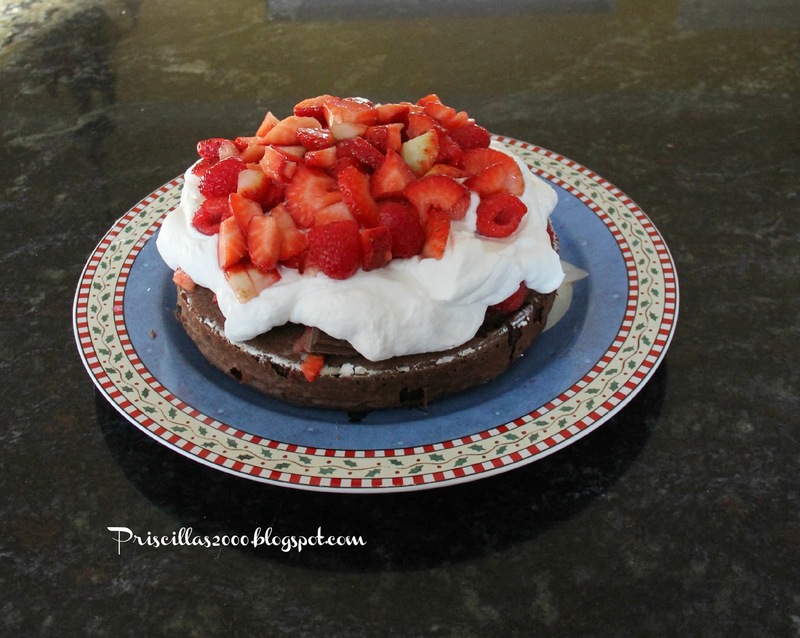 Priscillas: Easy Chocolate Cake With Strawberries, Raspberries and Candy bars ! 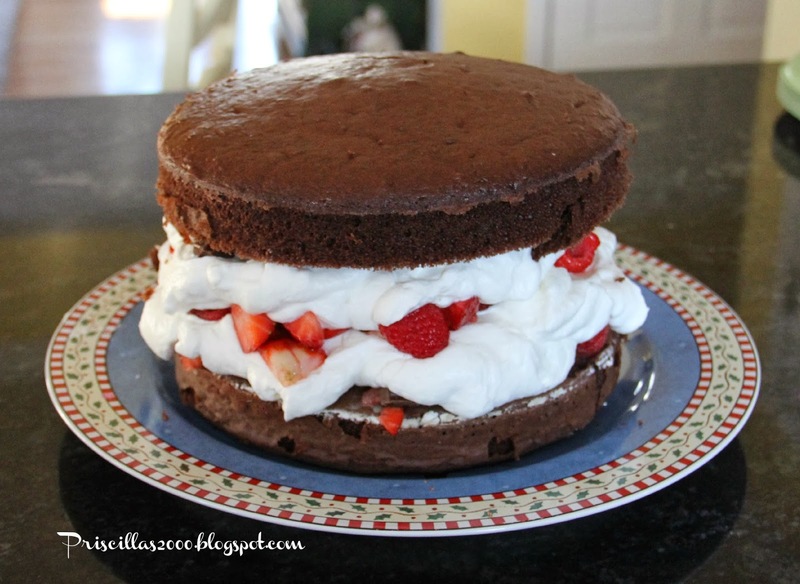 Easy Chocolate Cake With Strawberries, Raspberries and Candy bars ! Last week was one of my sons 21st birthday .. 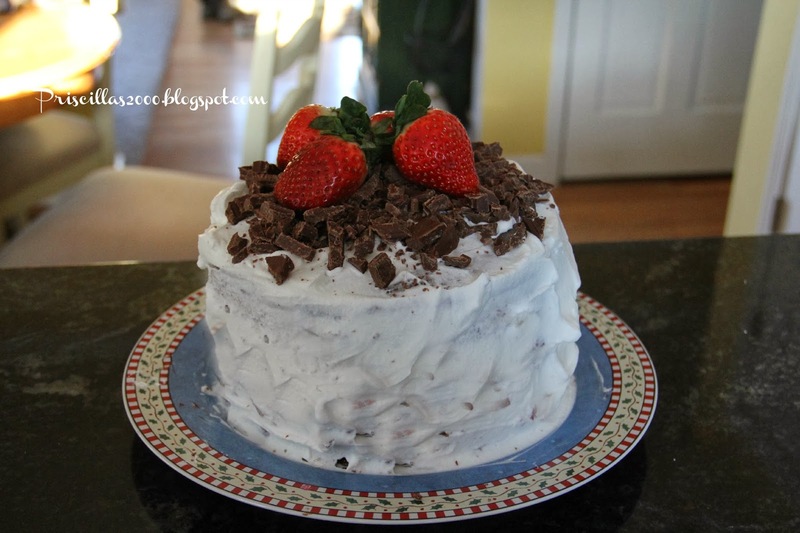 So I came up with this cake full of strawberries, raspberries and hershey bars ! I made a regular devils food chocolate cake in 2- 8 inch round pans. I sliced up a container of strawberries and left a few whole ones to place on the top. I added the raspberries and about 1/8 cup sugar .. I chopped the hershey bars I used 8 of them into small pieces.I beat a carton of heavy whipping cream until it was stiff in my mixer.When the cake was cooled, I added 1/2 of the strawberries and raspberries, to the top of the first layer. Then dolloped on some of the whip cream, then added the rest of the strawberries and raspberries ..!/2 of the chopped candy bars, more whip cream , then the other layer of cake. I used the whip cream then to frost the whole outside of the cake ..then added the rest of the chopped hershey bars and the whole strawberries for decoration. It tasted amazing and was so pretty too ! My daughter and I also made a trip to the Good Will store.. 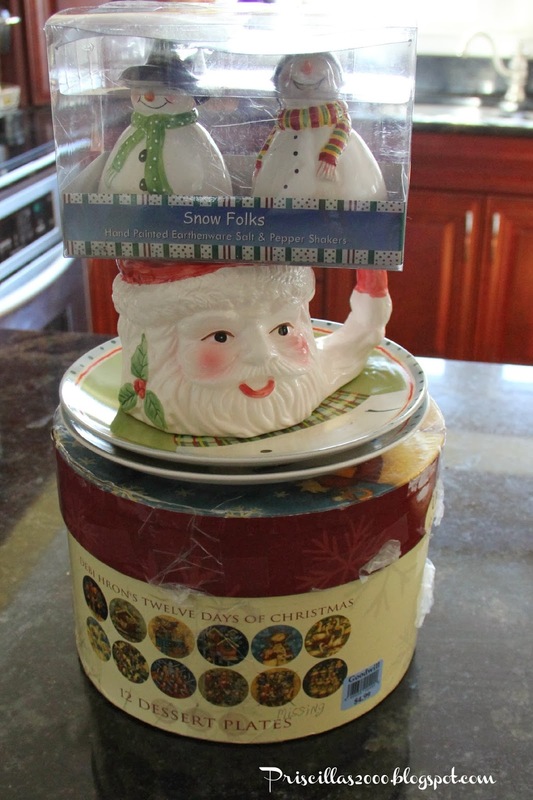 I found 2 different sets of great winter salad/desert plates, one is the 12 days of Christmas.. the other is snowmen.. A really cute salt and pepper snowman set , Santa mug , the cute little oval mirror will be a chalkboard.. and a rusty lantern .. 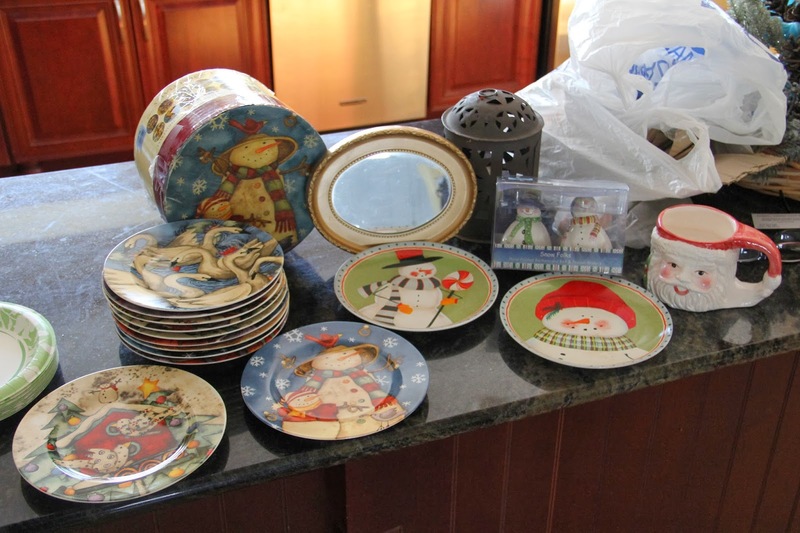 I spent $13.00 for it all , looked up the 2 dish sets on Ebay , and the snowmen plates were $19.99 each ! The 12 days of Christmas I found for $29.00 .. I think I got some really cute things ! We had another snowstorm yesterday .. 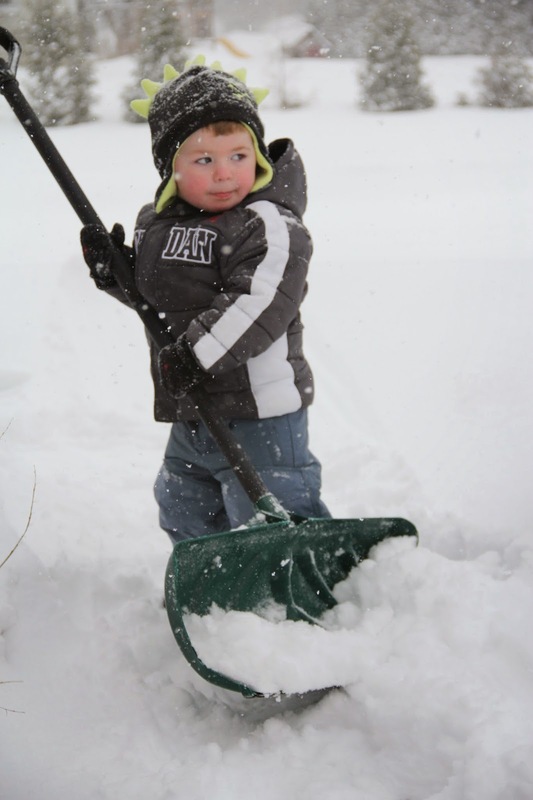 I had to enlist everyone to help shovel :) The youngest grandson loves the snow! Oh my, I would like a slice right now, please. What a wonderful combination. Oh, that cake looks amazing!! I'm sure it was delicious :) And what great treasures you found at the thrift shop, Priscilla--I know you'll find the perfect place for them in your Christmas decorating! Sure wish I had your little helper to help shovel our snow. We got more last night, too! That cakes looks almost too good to eat! What treasures you found at Good Will. I never have luck there! Priscilla, that cake!!!!! oh my, it looks amazing and I bet it tasted amazing too!!!! Great bargains at the thrift shop, such great additions to you Christmas decorations for later in the year, love the salt and pepper shakers, so cute!! You've had so much snow, haven't you??? Your Grandson looks like he's enjoying himself though! Yummy cake!! 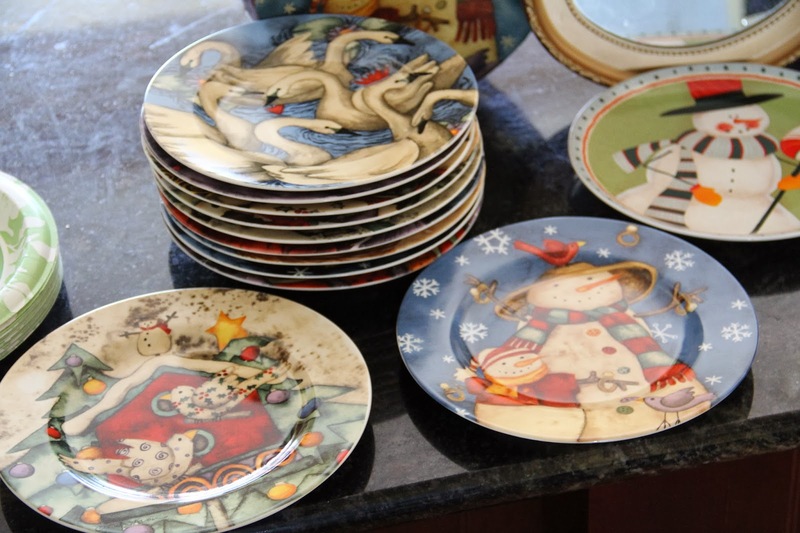 I LOVE the snowman plates and shakers!! You picked up some good deals. YUM Priscilla! The fruit in the middle would be my favorite part. Little man shoveling is so darn cute! Thanks for sharing with SYC. Cake looks sooo yummy! Love all your bargains! I like to look stuff up on ebay after I buy it some where else too! A fun post to find at SYC Have a great week! What a gorgeous cake! I bet it tasted wonderful too! Thanks for sharing!